There are certainly some challenges ahead for Apple Watch (and for me) but I think it's achievable (for both of us), and it will be an interesting experiment and experience. The date is Sunday 9th September, 2018 and the location is Tenby and the beautiful Pembrokeshire countryside. I start my training proper on December 4th and will be coached by the excellent John Rowland at Cycloform - John ran the Raid Pyrenean ride I did in June this year (where I discovered my 'climbing pace' - spoiler alert! It's not fast! ), and also provided some support and guidance on the last month before my first IronMan in Maastricht in Aug this year. This time John gets 10 months to get me in to shape. I'm not fast - I like to say I'm a below average runner, a just below average cyclist, and an average swimmer - so my target is sub 14hrs for this event. It's one of the tougher IronMans though. All training is effectively remote since John is hundreds of miles from me, so we will be using technology a lot to coordinate and communicate. At the core of that is Training Peaks as the platform for him to create and monitor my training plan, and that is where I will post my data from Apple Watch using various apps. Apart from subscribing to this blog of course, you can also follow any of the software platforms I will be using. TP doesn't seem to have a way of making everything public but I'll share certain workouts as need be on the blog. I'll be sharing most of the training on Strava as normal - feel free to follow me there. And of course you can follow me on the Workout app on Apple watch - just add Ian@bbits.co.uk and I'll accept all requests. This way you see all the day's activity, though in less detail. What is an IronMan again? 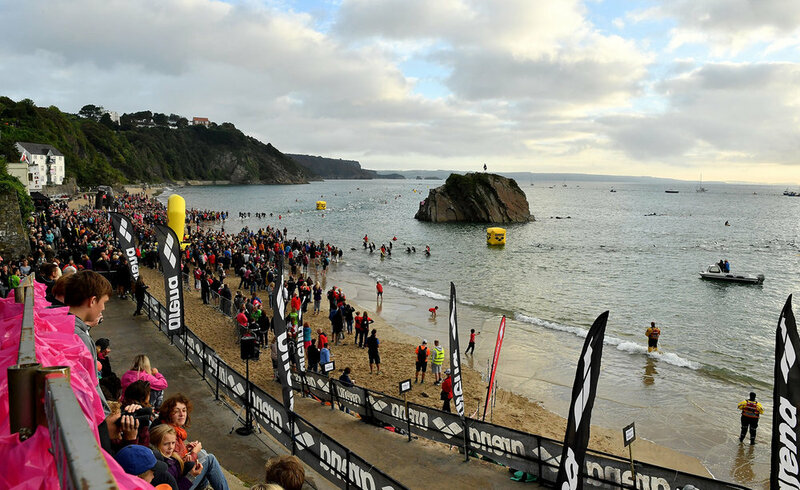 Swim for 2.4 miles usually in the sea, usually in a wetsuit (in Tenby they like to mix it up and add a couple of extra challenges so it's two laps of a "triangle" in the jellyfish infested sea, with a short run across the beach in between). It's a beautiful part of the world, and the support is legendary - they'll be families camped at the top of those hills all day cheering you on. T1 - or "transition 2" where you get off your bike, and quietly say to yourself, "just a marathon to go now"
IronMan Wales will be my second IronMan, my first was in August this year in Maastricht and was disappointingly slow - though within the cut-off and I did cross the line - the goal this time, as noted above is sub 14hrs. Wish me luck!